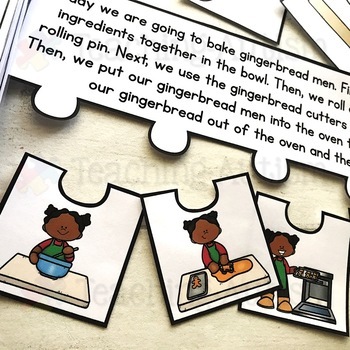 This Gingerbread Man pack is a great way for students to work on their sequencing skills. There are sequencing jigsaws and an adapted book included. 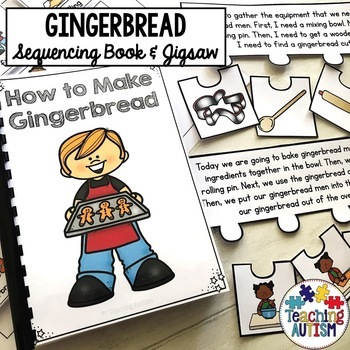 Your students will love sequencing how to bake gingerbread with these resources. 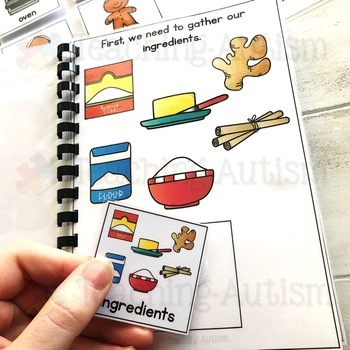 There are 4 different sequencing jigsaws included in this pack as well as the adapted book. Students read the short story on top of the jigsaw puzzle - or be read it. Then, they use the matching jigsaw pieces to order the sequence of the story. This is a great way for students to work on their attention to detail skills and to order a sequence of events. 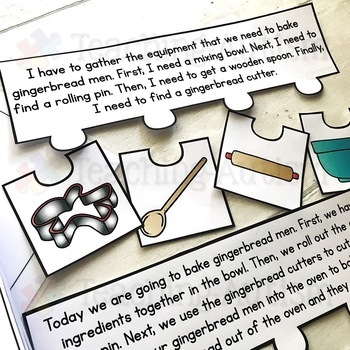 These activities are also great visuals for you to use when baking gingerbread. We love using them in class when we bake. It provides students with an extra level of independence. All the jigsaws and the adapted book come in both col and b/w option for your preference.